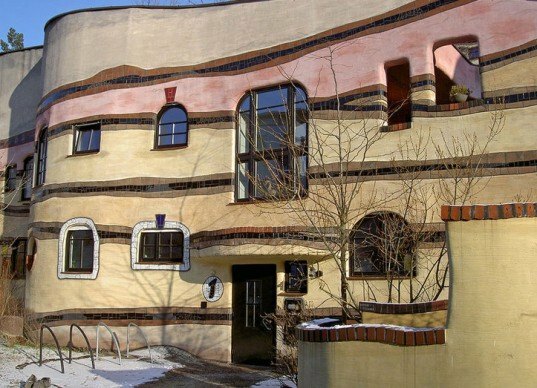 It may look like something out of a Walt Disney film, but this multi-hued, swirl of an apartment complex is 100% real and located in Darmstadt, Germany. Dubbed the Waldspirale, which translates to "forest spiral" in English, the building has another feature (besides looking crazy) that makes it unique - it has a forest growing on top of it! 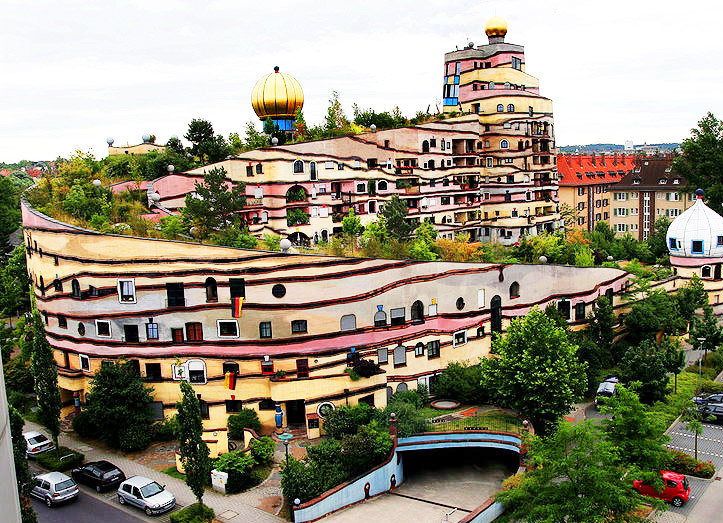 Designed by Austrian artist Friedensreich Hundertwasser and built by architect Heinz M. Springmann, the kooky residential complex is certainly one of a kind and must be an enchanting place for its regular tenants - as well as its "tree tenants," as Hundertwasser lovingly referred to them - to make their homes. The Waldspirale contains 105 apartments, a parking garage, and a kiosk. There is also a café and bar located at the top of the forest spiral (imagine how nice that must be!). The building is shaped like a U, in the center of which there is an inner courtyard, playground, and small artificial lake for young residents to play in. The Waldspirale’s breathtaking diagonal green roof is planted with grass, shrubs, flowers and trees that wind their way up the path of the 12 story building. But those aren’t the only plants that make their home at the Waldspirale. As is typical of a Hundertwasser building, “tree tenants” also protrude from windows and along the facade of the building (though, unfortunately, they don’t pay rent). And the fun doesn’t stop there. If you take a closer look, the building has some other weird characteristics that you won’t see elsewhere – at least not all in one place. For starters, the Waldspirale has over 1,000 windows and no two are the same. The handles that are attached to the windows and doors follow the same mismatched aesthetic. Oh, and did we mention the gilded onion domes? Yes, the Waldspirale has got those too. Green roofs such as this one provide a number of environmental benefits: they reduce the urban heat island effect, insulate interior spaces, and help to reduce stormwater runoff. From the town of Bedrock....it's a place right out of history. I'm just kidding, I actually do kind of like it. It's unusual but not insanely designed. It doesn't go for the super modern style of celebrity architecture. The Waldspirale contains 105 apartments, a parking garage, and a kiosk. There is also a café and bar located at the top of the forest spiral (imagine how nice that must be!). The Waldspirale's breathtaking diagonal green roof is planted with grass, shrubs, flowers and trees that wind their way up the path of the 12 story building. But those aren't the only plants that make their home at the Waldspirale. As is typical of a Hundertwasser building, "tree tenants" also protrude from windows and along the facade of the building (though, unfortunately, they don't pay rent). And the fun doesn't stop there. If you take a closer look, the building has some other weird characteristics that you won't see elsewhere - at least not all in one place. For starters, the Waldspirale has over 1,000 windows and no two are the same. The handles that are attached to the windows and doors follow the same mismatched aesthetic. Oh, and did we mention the gilded onion domes? Yes, the Waldspirale has got those too.